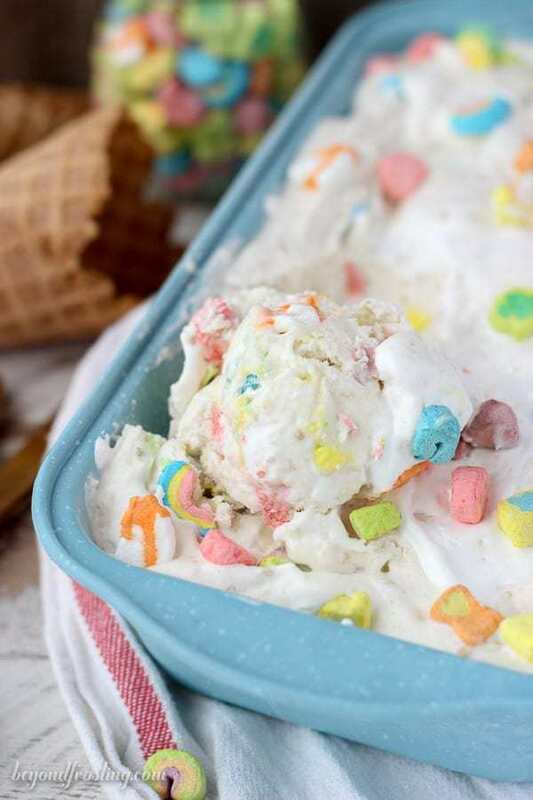 This Lucky Charms Marshmallow Ice Cream is a cereal milk flavored vanilla ice cream layered with the marshmallow fluff and Lucky Charms marshmallows. It’s gooey, sweet and all together magical. If you follow me on Instagram, you might have seen that I spent my time separating my box of Lucky Charms into marshmallows and cereal. What I noticed is that the ratio of cereal to marshmallow needs some serious attention. Although I don’t mind the cereal without the marshmallow, when I pour a cup of Lucky Charms I expect to get some nice colorful charms in my cereal. When I actually separated them out, I was shocked at how few marshmallows there were! Thankfully there was plenty for this ice cream. Can I tell you that I prefer to eat my cereal from coffee mug instead of a bowl? I don’t like to have to dig around my bowl to find my cereal and I prefer a small amount of milk to my cereal, so a coffee mug is perfect! Oh! I almost forgot to tell you that you can also buy dehydrated marshmallows and skip the cereal all together. You can get a 1lb bag from nuts.com or if you’re super aggressive they have them in bulk. Don’t worry you only need one box of cereal for this recipe. 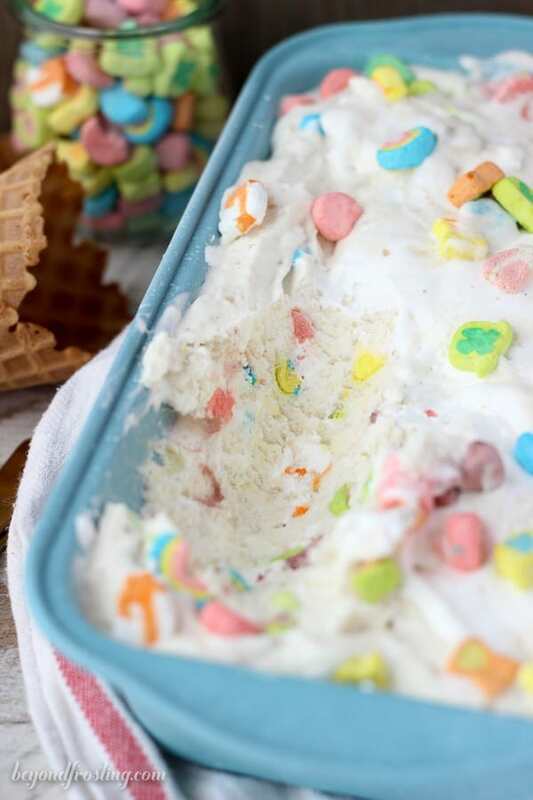 I recently learned that one of Salt and Straw’s monthly flavors is called Pot of Gold and Rainbows, which is their version of a cereal milk ice cream loaded with Lucky Charms marshmallows. So I did what any normal human being does and got my hands on a pint of ice cream for product testing purposes. My version of this ice cream is slightly different in that it’s also loaded with a lot of marshmallow fluff. You know it’s a special occasion when I bust out my actual ice cream maker. The base of the ice cream is a basic cereal milk flavored vanilla ice cream (part heavy cream and part whole milk). 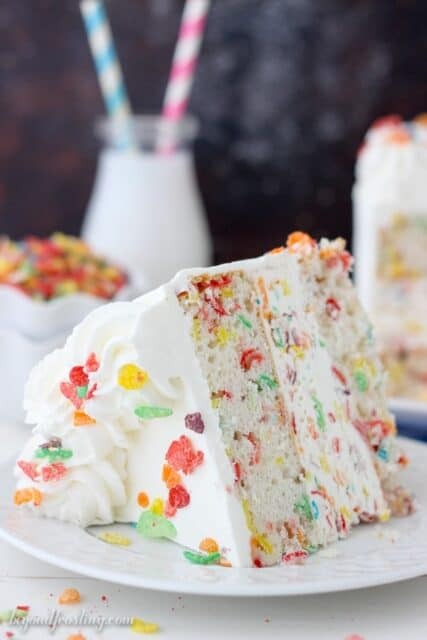 It’s layered with the marshmallow fluff and Lucky Charms marshmallows. The marshmallow fluff doesn’t freeze all the way which is actually kind of nice because it helps keep the ice cream soft! 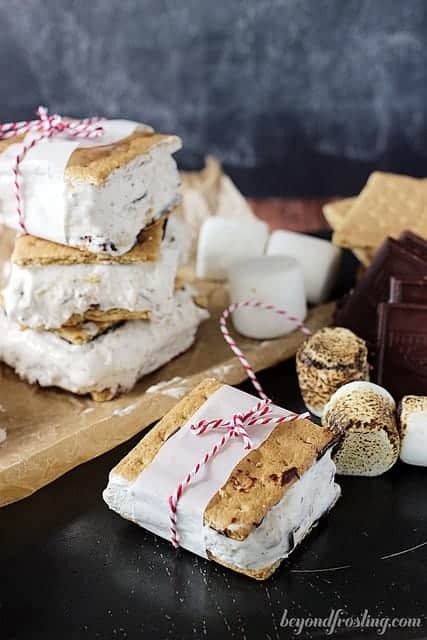 This is the same ice cream base I used in my Peanut Butter Cup S’mores Ice Cream. It’s a recipe that has been adapted from Simply Scratch. To prepare the ice cream base, I heated the milk on the stovetop together with some sugar until it’s dissolved. Then the milk needs to be cooled and refrigerated until it’s completely cold again. While it’s cooling down in the fridge, I added some cereal that I pulsed in my food processor. The cereal doesn’t dissolve, but it adds a nice flavor to base for the ice cream. I did use my strainer when I pour the ice cream based into the mixer to filter out the large cereal that did not get absorbed. I am beyond excited to share this recipe which I made just a few days ago because it is SO so good, and it happens to be St Patricks Day on Friday. I’ve already got my pot of gold at the end of the rainbow (looking at you babe! 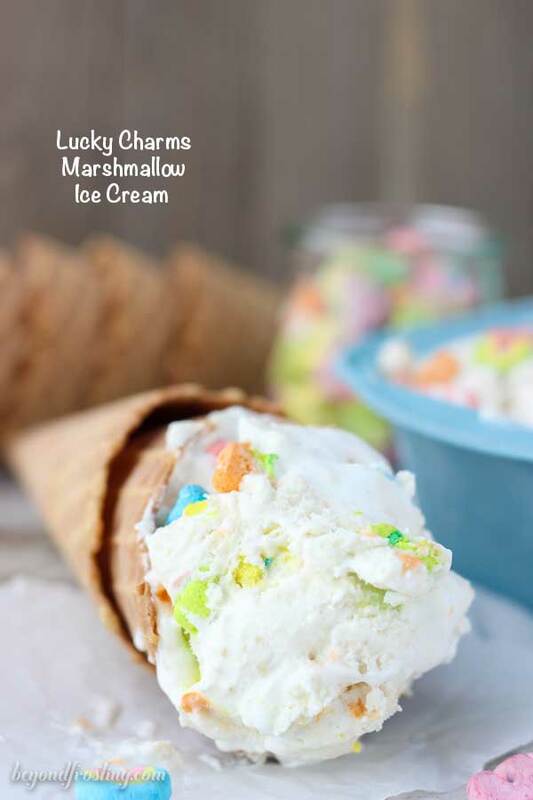 ), but this ice cream can also be my pot of gold. I am totally okay with that. 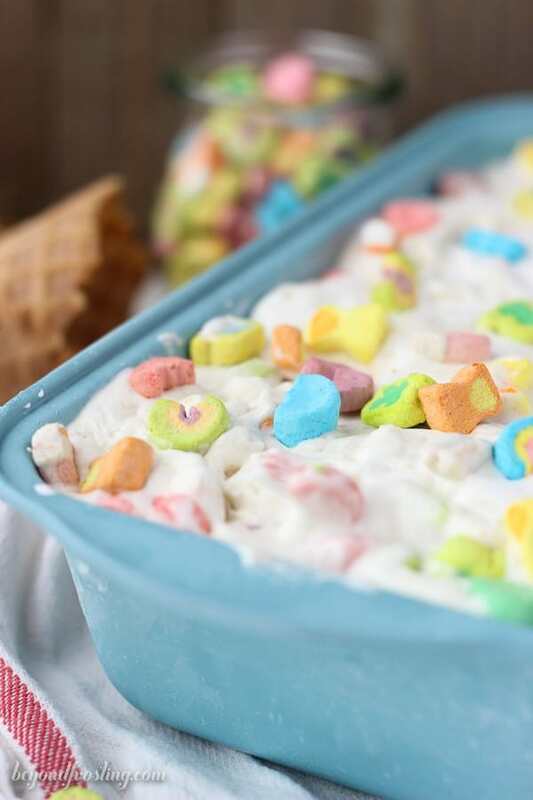 This Lucky Charms Marshmallow Ice Cream cereal milk flavored vanilla ice cream layered with the marshmallow fluff and Lucky Charms marshmallows. It’s gooey, sweet and all together magical. Pre-freeze yourice cream maker attachment as directed, usually at least 15 hours in advance. Take a box of Lucky Charms cereal and separate out the colored marshmallows into a separate dish. Separate out one cup of Lucky Charms cereal, without the marshmallows and pulse in a food processor until it is a fine crumb. Next add the 2 cups of heavy whipping cream, cereal crumbs and vanilla extract. Refrigerate until it’s completely cooled. Once frozen, set up the ice cream maker, and spin on low speed. Strain the liquid base through a fine sieve to catch the cereal that did not absorb into the milk. Pour the ice cream base into ice cream maker after it starts spinning. Stir on low speed for 10 minutes and increase to medium speed for another 5-10 minutes until the ice cream solidifies to a thick soft-serve like consistency. Prepare a freezer-safe container and you’ll divide the ice cream into thirds. Layer the bottom of the pan with 1/3 of the ice cream, then add a few spoonsful of marshmallow creme and gently swirl with a knife. Then sprinkle in 1/3 of the Lucky Charms marshmallows. Repeat this step two more times, ending with swirls of marshmallow and the cereal charms on top. You can use as much marshmallow and cereal charms as desired. – Be sure to allow for enough preparation time to freeze your ice cream maker and another 4-6 hours for your ice cream to completely freeze. – If you prefer not to use whole milk and heavy cream, I suggest using all heavy cream. I’m making this for my sons class as their St. Patty’s Day treat. There are 14 of them. How much does this yield? Hi Lynn, I think 2 or 3 batches depending on how much you want to serve each person. One batch fills a large loaf pan. This looks so good. I cannot wait to try this out. 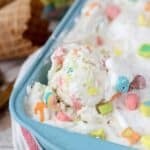 I think I’ve found my weekend ice cream making goals! 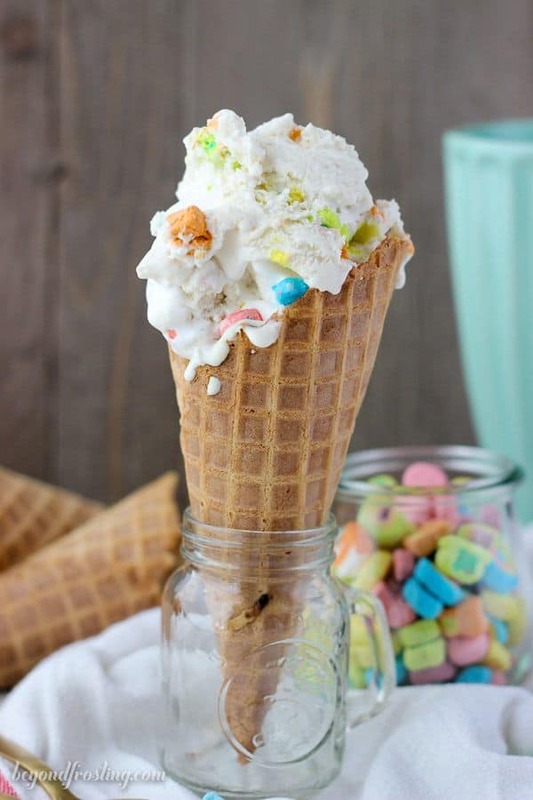 I live in the UK which means I’ve never had Lucky Charms but this ice cream still looks irresistible! Cereal milk is so goooooood, it belongs in everything! Oh no Kelly! I wish I could send them to you! I agree with you on the cereal milk! I love ice cream and I always wanted to have it in a snowfall….